There is nothing I dislike more than dealing with charging my cellphone. Especially since it seems like I do it way too often. I’ve even gone as far as taking out a staple gun and attaching the cord to the back of a shelf so that the top sticks out and the cord never unhooks from my phone and falls down. That does make it easier, but something like this myGrid from Duracell would be far more simple. When it comes to charging, simple is definitely a good thing. Instead of plugging in your cellphone every single time you need more of a charge, wouldn’t it be nice to just plop it down on a flat surface? Especially for those of you in families with multiple cellphones, you’d never have to worry about dealing with a tangle of cords from too many chargers in one area. This will charge MP3 players, phones and other devices by slipping a power sleeve or power clip onto the gadget. 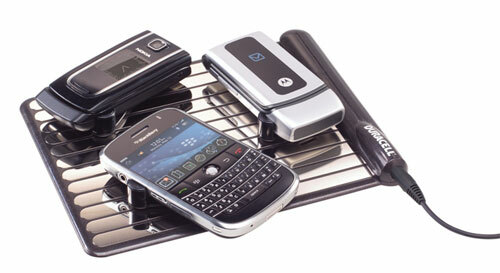 Within the phones it will work with the iPhone, Blackberry, Nokia and Motorola phones. You can expect the myGrid to be shipped out this October.